After our lunch in Buon Giorno, we decided to try the newly opened frozen yogurt shop in cliff house. It’s name… Fling. According to their flyer: Fling only uses fresh yogurt that’s made from a local farm unlike others who use processed, powdered stuff. So not only are you getting something yummier and healthier, you’re also helping local farmers. 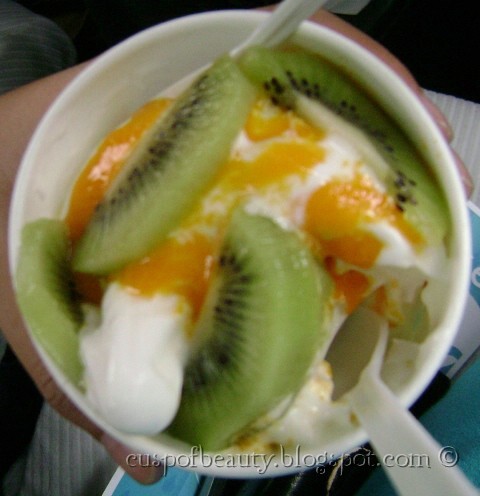 What I ordered was a casual-sized yogurt with mango sauce and kiwi. The yogurt was smooth and creamy. The mango sauce was not too sweet which was good, and the kiwi provided an additional tang. On August 20, at around 5pm, we started our journey to Tagaytay. For dinner, we headed to Taaleña. This restaurant offered Filipino food. Since it was still a weekday, we were the only guests. We were seated outside where, would there had been sunlight, we had a view of Taal Volcano. We ordered Sinigang na Salmon Head sa Miso, Lechon Kawali and Adobong Kangkong. The sinigang was good. It was hot, sour and thick. Of course, the salmon tasted good. The lechon kawali was like the usual. The adobong kangkong was a little bit different. The sauce was thick like asado. august celebration, part 1 – brazil! brazil! August 20 – Junjun and I are celebrating our 8th anniversary as boyfriend-girlfriend. Since August 21 is a holiday, we decided to take a looong weekend. Our first celebration was in August 19, when we had dinner at Brazil! Brazil! in Serendra. Brazil! Brazil! is a churrascaria. They serve an eat-all-you can of grilled food and sidings. 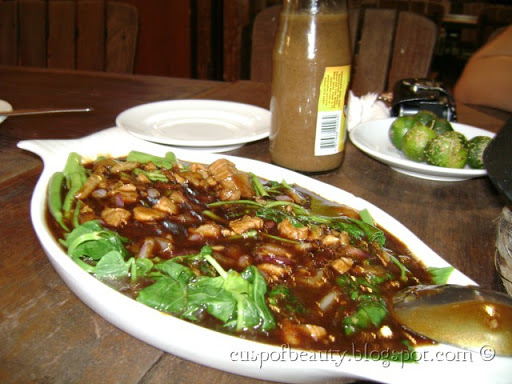 They grill all kinds of food – chicken, pork, beef, seafood, corn, pineapples, banana, etc. There was a section where you can choose your salad, pasta, mashed potato, rice and dessert. A key element in dining there is the yo-yo that is placed on the table. If you want to be served churrasca, you just have to make sure that the green side is up. Otherwise, put the red side up if you want to pause from eating. After we arrived, we ordered drinks and we were served the soup. I had the mango-pandan iced tea and Junjun had the Mango Lychee shake. We helped ourselves to some salad, and then we turned the yo-yo green side up, and the grilled food started coming. We had cuttlefish, pork shoulder, chicken fillet, beef sirloin, beef brisket, schublig and schublig with cheese. We also had some mashed potatoes from the siding section. When we had our fill, we had a dessert of fruit salad and chocolate cake. Weekday buffet is priced at Php 628.00 (net). Drinks are priced separately. For those who are “carnivores” and love to eat meat, this is definitely the place to eat. I write you this letter with tears in my eyes and as if steel fingers are crushing my heart because I wanted so much to be with you as you celebrate your legal emancipation. Now that you have come of age, my love, a voice tells me that I am no longer young and suddenly, I feel old. An old poet gave this advice very long ago “when you are sad, remember theroses will bloom in December.” I want to send you bouquet of roses, big red roses from my dreamland garden. Unfortunately for the present, my roses are not in bloom, in fact they have dropped all their petals and only the thorns are left to keep me company. I do think it is fitting to send you a thicketof thorns on this memorable day! I am very proud of you because you have inherited all the best traits ofyour mother. You are sensible, responsible, even-tempered and sincere with the least pretenses and affection which vehemently detest in a woman. I amsure like your mother, you will possess that rare brand of silent courage and that combination of fidelity and fortitude that will be the life vest of your man in the tragic moments of his life. During my lonely hours of solitary confinement in Fort Magsaysay, Laur, Nueva Ecija last March and April with nothing else to do but pray and daydream,with only my fond memories to keep me company, I planned a weekend barrio fiesta for you in Tarlac for your 18th birthday. I fooled myself into believing that my ordeal would end with the fiscal year. I planned to invite all your classmates and friends and their families for the weekends. The schedule called for an early departure by bus from Manila and the first stop will be Concepcion, where lunch will be served by the pool. And after lunch, you were to visit the Santa Rita Elementary School to distribute cookies and ice cream to the children of that public school where you were first enrolled. I guess sheer nostalgia prompted me to include Santa Rita. We were only three then: Mommie, you and I. Those were the days of happy memories little responsibilities, tremendous freedom, a great future ahead and capped by a fulfillment of love. You are the first fruit of our union, the first proof of our love and the first seal of our affections. From Concepcion we were to proceed to Luisita for the barrio fiesta. I intended to invite a friend who could roast an entire cow succulently. Swimming, pelota, dancing and eating would have been the order of the day. Sunday morning was reserved for a trip around the Hacienda and the mill and maybe golf for some of the parents and later a picnic-lunch on Uncle Tony’s Island . Return to Manila after lunch. I am afraid this will have to remain as one of the many dreams I had in Laur. Our future has suddenly become uncertain and our fate unknown. I am even now beginning to doubt whether I’ll ever be able to return to you and the family. Hence, I would like to ask you these special favors. Love your mother, whose love for you, you will never be able to match. She is not the greatest mother in the world, she is your sincerest friend. Take care of your younger sisters and brother and lavish them with the love and care I would like to continue giving them but am unable to do so. Help Noy-noy along and pray hard that he will grow to be a real, responsible man who in later years will protect you all. You are the model for your three younger sisters. Your responsibility is therefore great. Please endeavor to live up to our highest expectations. Be more tolerant to Pinky, more accessible to Viel, our little genius-princess, and more charitable to Krissy, our baby doll, and make up for my neglect. Finally, forgive me, my love, for not having been an ideal, good and thoughtful father to you all as I pursued public office. I had hopes and high resolve of making up, but I am afraid my destiny will not oblige. I seal this letter with a drop of tear and a prayer in my heart, that somehow, somewhere we shall meet again and I will finally be able to make upfor all my lapses, in the kingdom where justice reigns supreme and love is eternal.